Cooper loves to build. So when I had the opportunity to review Back to Blocks wooden blocks, I jumped at the opportunity. 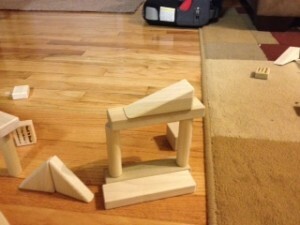 Wooden blocks are great toys for any age, even the “old” kids. Here is a little more information on Back to Blocks. “Back To Blocks” is a family owned and operated business located in Kaysville, Utah, U.S.A. We handcraft and sell wooden building blocks for children. Our whole family has been involved in launching our business. It’s been a lot of fun working together to provide you with the greatest toy blocks. We are committed to providing a safe, durable, natural, quality product. Our blocks are from natural hardwood. They have no paints or dyes or stains. We use poplar. A beautiful hardwood that comes naturally in a variety of color variations. It can range from white to greenish to purple.It is light, sturdy, and affordable. I love these blocks. They are soft and safe for Cooper to use. I love the thought these are handcrafted with no dyes that can hurt the kiddos. I love how smooth and sturdy they are. Cooper was so excited to get some new blocks to build with. Cooper is at the age that when he builds something it’s all about how to crash it down. It might be with his Angry Birds or a car that cashes into it. But does it really matter? 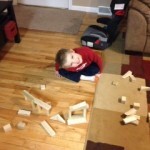 What matter is he is having fun and it allows him to use his imagination when building. If you have a wee little one these are great for learning some great creative skills and hand eye coordination. Remember they are as safe and all natural, can’t get any better than that!